During a meeting of the Denver City Council last week, it was announced that renowned alternative rocker Dean Ween is planning to open the world’s first cannabis-friendly concert and events venue in Denver — Dean Ween’s Honey Pot Lounge — in Spring 2019. The news emerged amidst discussions of the I-300 Task Force’s recommendations for reforming licensing procedures for businesses hosting social consumption of legally purchased cannabis. Deaner will be partnered with some of the most respected and influential figures in Colorado’s cannabis industry in this groundbreaking venture. Dean Ween’s Honey Pot Lounge will share space with the Circus Collective at 2041 Lawrence Street in Denver, next to Coors Field, home of the Colorado Rockies; the music venue is projected to have a capacity of 200. In daylight hours, the Collective will host art exhibits and offer a range of wellness and fitness programs. When the stars come out, Dean Ween’s Honey Pot Lounge will bring world-class entertainment, top-drawer cannabis and Denver’s powerful sense of community together in a uniquely uplifting experience. Deaner himself plans on performing at the venue regularly as well as curating the Lounge’s bookings, diving deep into his personal address book to tap old friends and touring partners from myriad genres, booking show line-ups that will delight and amaze Denver music aficionados. He is also committed to supporting and encouraging the local music and art scenes by showcasing local talent. 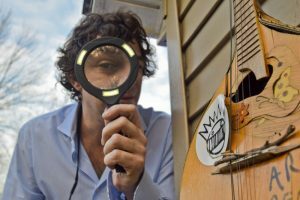 As one of the first licensed social-use clubs featuring live music in the United States, Dean Ween’s Honey Pot Lounge hopes to become a destination for music and cannabis lovers from around the globe.